Indonesia’s blues queen Indah Winar joins forces with composers/producers Christian Hansen (USA) and Henrik Lisby (Denmark) in this rock trio extending a music collaboration over three continents. This debut album capitalizes on the successful singing career of Indonesia’s blues queen Indah Winar joining forces with composers/producers Christian Hansen (USA) and Henrik Lisby (Denmark). This old school rock trio extends their music collaboration over three continents which presents original, but previously unreleased, compositions spanning over four decades.The album combines great melodic rock compositions with Christian Hansen’s screaming lead guitar, Henrik Lisby's sophisticated music arrangements, and Indah Winar’s best vocal performances ever. 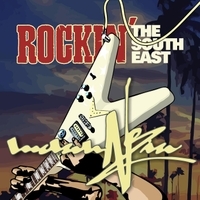 I find that Rockin' the Southeast is a refreshing rock album with a high degree of originality and musicality. "Rockin' the Southeast" sports, a catching groove, great lyrics and well arranged chorus and solos. The song 'Tonight's Our Night' is a beautiful quiet song with a great semi-acoustic guitar arrangement. In "Indah Night" the synthesizer theme supplements Indah's song to create the right associations / mood for the lyrics. I highly recommend this album to the picky listener. I love this album! After having spent countless hours for way too many years trying to find an original Sound of Rock with intelligent arrangements, I finally found it! Why bother with lame cover artists when you can get the Real Thang! This talent and drive you would normally expect from only the established top names of rock, but think again: IndahNezia delivers! Thumbs up for authenticity! Strong rock with a clear thread to its late seventies/eighties roots. Simple yet advanced compositions (they sound straight forward but contain quite advanced harmonics). And the cover is spot on and shows it how it sounds... welcome back in time. Highly recommendable! This album brings me back in time – but in a current way. I sense clear jazz-rock harmonics as well as quite heavy passages. Awesome guitar-arrangements (especially Using Me) and overall uniquely produced. It reminds me of something I cannot name – familiar but totally unique at the same time.